SINGLE TICKETS: Thur.-$22, Fri.-$27, Sat.-$28, Sun.-$25 - Active Military, Student & Senior Discount & Great Group Rates. SPECIAL FAMILY RATES AVAILABLE FOR THIS SHOW. Book, Music and Lyrics by PigPen Theatre Co. The Old Man has kept his post as the sole caretaker of the moon for as long as he (or his wife, the Old Woman) can remember. Each night, Old Man must fill up the moon with liquid light. He and his wife have been doing this same routine for so long, they’ve forgotten who they are and why they started filling up the moon in the first place. When his wife is drawn away by a mysterious melody sparking memories of their shared past, the Old Man must decide between duty (and routine) and love (and adventure). Luckily for audiences everywhere, he chooses the latter, and what follows is an imaginative sea-faring epic, encompassing apocalyptic storms, civil wars, leviathans of the deep, and cantankerous ghosts, as well as the fiercest obstacle of all: change. 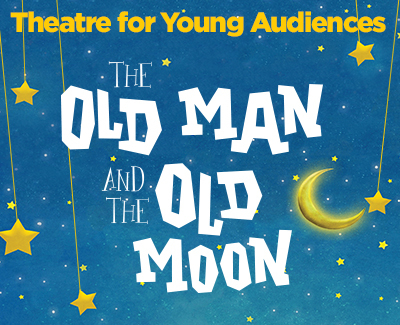 Created and performed by PigPen Theatre Co., and heavily flavored with folk music and shadow puppetry, The Old Man and the Old Moon will be directed by Playhouse favorite Desha Crownover (Seussical, The 39 Steps and Macbeth). Renowned for her mastery in creative storytelling and her expertise with theatre for young audiences (as Artistic Director for San Diego Junior Theatre), Ms. Crownover is the perfect choice to bring this award-winning theatrical tale to the CPH stage. Adults, Seniors, Military and Students purchasing a table of 4 or 5 tickets to any one EVENING performance receive a 20% discount, per ticket. Friday, May 17, 2019 at 6:30 p.m.